Editor’s Note: After the publishing of this story it was announced that Alexandra Fearn was disqualified from her victory in the DARE Stock feature for a ride height violation. It gave the victory to Tyler Trott of East Hartford. Brandon Michael of Granville, Mass. was moved to second and Johnny Walker of Ludlow, Mass. to third. 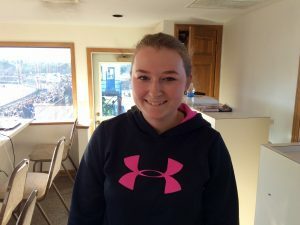 STAFFORD – Alexandra Fearn left Stafford Motor Speedway last week looking at destroyed racecar and thinking a trip to victory lane was likely not anywhere near in her future. She wasn’t even sure she’d be back at the track in a week. Finish she did, in perfect style. Fearn won the 15-lap DARE Stock feature Friday at Stafford Motor Speedway. It was the second victory of the season for Fearn, of East Longmeadow, Mass. Tyler Trott of East Hartford was second and Brandon Michael of Granville, Mass. third. Following a lap seven restart, Fearn used the outside lane to get by Zack Robinson for the lead. From there she never trailed again. Daniel Wesson used a lap 13 restart to get by Todd Douillard for the lead and went on to win the 20-lap SK Light Modified feature. It was the second victory of the season for Wesson, of Monson, Mass. Douillard, of Palmer, Mass., held on for second. Tony Membrino Jr. of Berlin was third. Justin Bren of Palmer, Mass. led every lap to win the 20-lap Limited Late Model feature. Rookie Bryan Narducci of Colchester, making his sixth start in the division, had a career best second place. Albert Saunders of Stafford was third. Noah Korner of Canton won the 20-lap Legends feature. Teddy Hodgon of Danbury was second and Joey Ternullo Jr. of Middletown third. Bummer about the DQ Alexandria. So sorry. I think you are one of the most exciting drivers to watch in the DARE stock series. I was rooting for you all the way to the checker flag. Keep driving on the high side. That is what Tony Mambrino is doing in his SK Lite. That is what Ryan Preece used to do in the SK car. Keep up the great driving.